Ingredients: 250g Gnocchetti, 500g cherry tomatoes, 1 bunch rocket, 3 spoons Parmigiano Reggiano cheese, 70g pine nuts, 1 garlic clove, 3 spoons extra virgin olive oil, mature ricotta cheese, salt and pepper. Preparation: Boil Gnocchetti into abundant salted water. 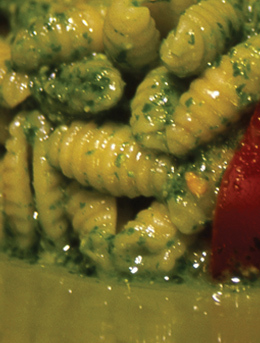 Drain them "al dente" and let them cold. Prepare the rocket pesto, blending shortly garlic, pine nuts, rocket, Parmigiano Reggiano cheese in the oil; then add to it salt and pepper. Meanwhile cut tomatoes in cloves and let the flavour with salt and oil. 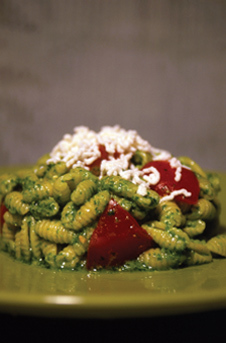 As soon as Gnocchetti are cold add to them rocket pesto, tomatoes and grate mature ricotta cheese over the whole. Serve with some rocket leaves.